OpenText™ "WFO Video Series: What Performance Goals Resonate Most With Executive Leadership?" - Open Text Web Solutions Usergroup e.V. 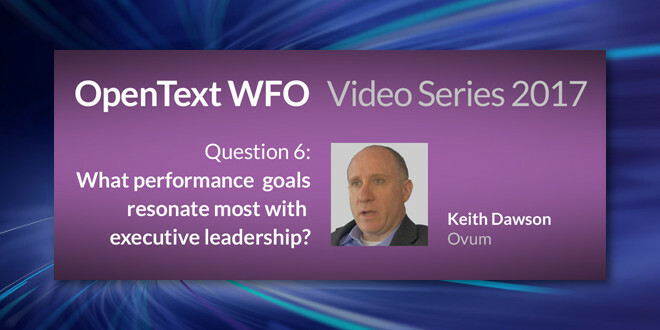 OpenText™ "WFO Video Series: What Performance Goals Resonate Most With Executive Leadership?" I’m really excited to write about this sixth question being asked as part of our OpenText™ WFO 2017 Video Series because it’s a question I’m often asked when meeting with customers and other contact center professionals. It’s also a question that our expert panel of speakers are dealing with in their professions, some are well-respected industry analysts and others highly successful practitioners. It’s a privilege to have their expertise to share with you. Today’s contact center leaders understand how important it is to gain the support of executive leaders in order to secure the necessary resources, technologies and budgets required to hit mandated KPIs. But that’s no easy task when the contact center is focused on metrics that are not well understood or even considered business-critical in the C-suite. So here’s the question again: what contact center goals or metrics resonate most with the leaders who make the high-level strategic business decisions and who control the purse strings?